First off, I apologize if this is placed in an incorrect forum. I haven't been on here in a year, at least, and I can't remember how things work. Well....I had a great America cosplay until about two hours ago when the jacket and I had an incident. Long story short, it's totaled and I don't know what to do. :/ I bought the outfit as a set from another cosplayer and I don't know if/how I can replace just the jacket. It wasn't anything fancy but it was one of the nicer-looking coats; [URL="http://www.ebay.com/itm/Hetalia-Axis-Powers-Cosplay-Costume-United-States-Outfit-America-1st-/181380679802?pt=LH_DefaultDomain_0&hash=item2a3b21887a"]this one[/URL] to be exact. I love this cosplay too much to simply give it up and I don't want to buy an entire set just for the jacket. Any suggestions would be appreciated! Well...what kind of damage was done to it? Are we talking like catastrophic rips/tears, stains, patches coming off? If there's absolutely no way to salvage it, I'd just suggest going to the nearest Goodwill or secondhand store and looking for a brown leather jacket. Buy some fur from Joann or another craft store and sew it to the collar, then use white duct tape to make the numbers and patches. For my America jacket I trolled the thrift stores and found a leather bomber jacket that I was able to use, I made the patches (the airplane and star) out of leather and glued them on with fabric glue, they make glue for bikers too that would work. Or if you can't find a jacket with the right kind of collar you could get a plain brown leather one with the right shape collar and sew/glue on some fuzzy black fabric to get the right look. 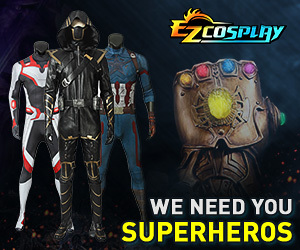 or check out cosplay shops online if you would like.